Gold statues, elaborate gowns, passionate speeches. Award season is upon us! With it brings a flurry of over-the-top events that make you want to grab some popcorn while reading about every beautiful detail. Thankfully, Bizbash's "28 Splashy Decor Ideas From the Week's Biggest Parties" is a good place to start for Emmy party coverage. From feeding the masses to breathtaking venues (we see you NoMad! ), we are enjoying each and every detail. HBO - This floral carpet is the thing dreams are made of (see main photo above). Ok, maybe our dreams? 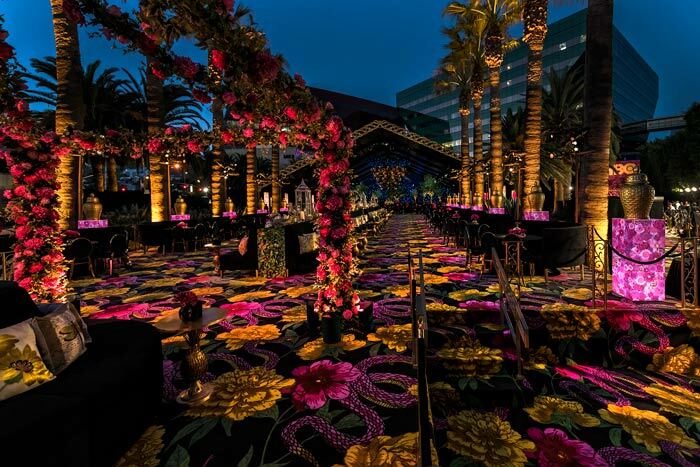 HBO's Emmy party ran with the Garden of Eden theme with said carpet surrounded by lush floral designs, custom 25ft walls and art installations. Governors Ball - Mixing things up this year, organizers decided to move away from a seated dinner (last year's was a record breaker). Instead guests enjoyed small bites while mixing and mingling "under the stars" (over 28,000 LEDs hung overhead-pictured below). With a staff of more than 250 chefs, 20 executive chefs, 50 bartenders and 600 servers this was certainly a well-oiled machine. Hulu - Lush velvet, branded gold accents and vending machines- we expect nothing less from The NoMad and Hulu. Oh did we mention the late night burgers? What a party! Whether you fall in love with a carpet or a couture dress on the red carpet, remember, it's all in the details! ©2019 Partner Productions Inc. All rights reserved.